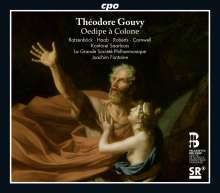 Der Artikel Louis Theodore Gouvy (1819-1898): Oedipe a Colone (Dramatisches Oratorium) wurde in den Warenkorb gelegt. The world premiere of the oratorio Oedipus at Colonus by the German-French composer Théodore Gouvy in the French original version on 6 December 1881 inspired great public interest. Gouvy himself described this day as the »happiest day in my life as a musician« – and did so even after his many successes not only as a symphonist but also as a chamber musician and creator of feature-length choral works. For this composer acclaimed in France and Germany, in major cities such as Paris and Leipzig, Oedipe à Colone not only became a success with the press and public but also a new musical experience to be followed by further dramatic, secular oratorios during the final years of his life. The story of the King of Thebes who unwittingly kills his father and marries his mother was just as dramatic as it was typical as subject matter in the nineteenth century, which repeatedly drew on classical dramas. After its premiere at the Gewandhaus in Leipzig, not much more was heard about Gouvy's free adaptation of this tragedy by Sophocles. Joachim Fontaine examined the score under its layer of archival mold and spent many years reconstructing it and working toward its revival. The Grande Société Philharmonique, the symphony orchestra conducted by Joachim Fontaine and deriving its name from the first French symphony orchestra led by Hector Berlioz, was finally able once again to perform Gouvy's Oedipe with vocal support from choirs including the Saarlouis Choral Society and internationally renowned soloists. 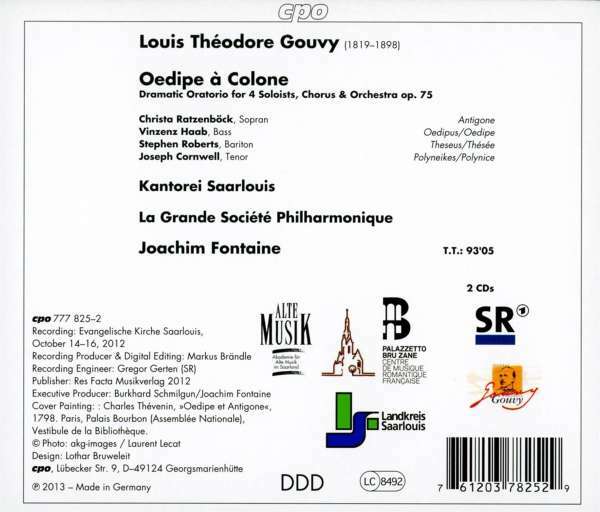 In 2012 these ensembles and the conductor were awarded the prestigious Grand Prix of the Académie du Disque in Paris for their premiere recording of Gouvy's oratorio Iphigénie en Tauride (Iphigenia in Tauris, also on cpo). Hörprobe Track 4: Chor: Polynice, salut! Hörprobe Track 10: Chor: Ah! Pitié! Hörprobe Track 13: Dieux vengeurs! Que vouliez-vous de moi? Dieux vengeurs! Que vouliez-vous de moi? Hörprobe Track 6: Chor: Édonée!